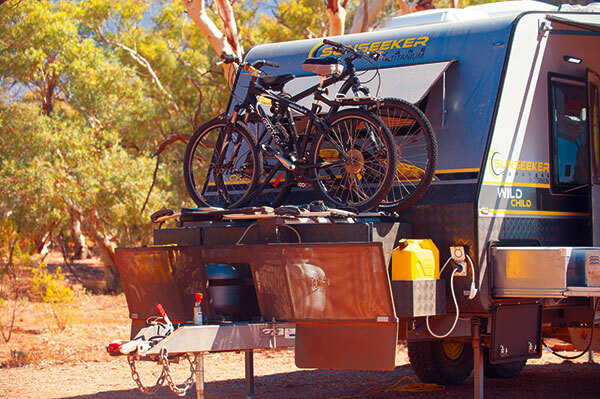 Here we were at historic Eldee Station in Silverton, a mere rocky outcrop or two from Broken Hill, for the AL-KO ‘Toughest Tow Test’—man, tow tug and, more importantly, a sextet of caravans pitted against a rugged, unforgiving terrain. And among the caravan convoy, and rust-red landscape, was a ‘Wild Child’. Not surprisingly, the daunting scenario proved a ‘marriage made in heaven’. I, for one, was indelibly impressed with its offroad towing capability. 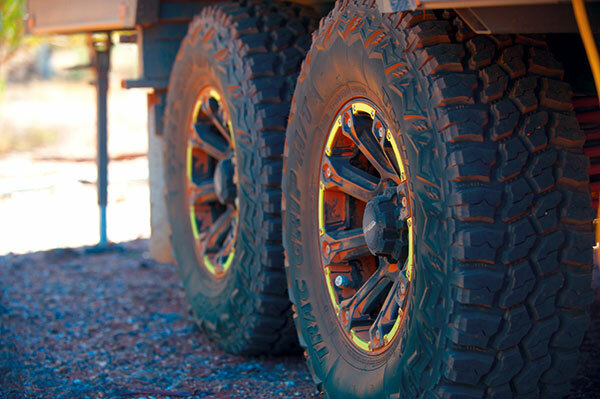 Obviously greatly assisting in this department were the van’s SupaGal chassis made with 3mm-thick Australian RHS steel, 6in drawbar with 4in chassis and 4in chassis raiser, a T-piece strengthener underneath the extended A-frame, 285/75 R16 mud-terrain tyres with load rated alloy wheels, and 12in brakes with offroad magnets. It may appear an oxymoron, but the Wild Child is indeed Sunseeker Caravans’ golden-haired child! Not only does it take family vanning to a new dimension, it promotes family togetherness in off-grid locales. 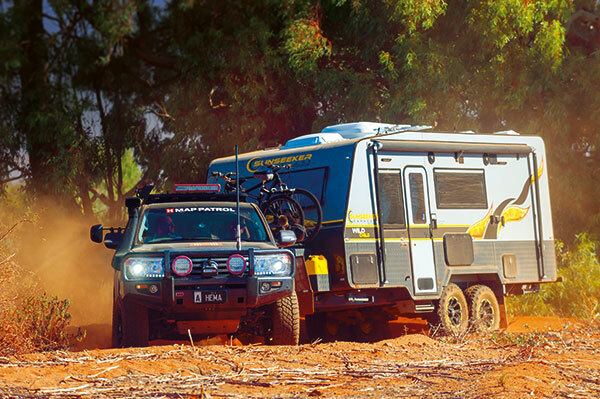 This classy 6.25m (19ft 6in) family bunk offroader will take you to the middle of nowhere, and there’s no disputing it’s pitched to any family with a penchant for rough-and-tumble free camping. 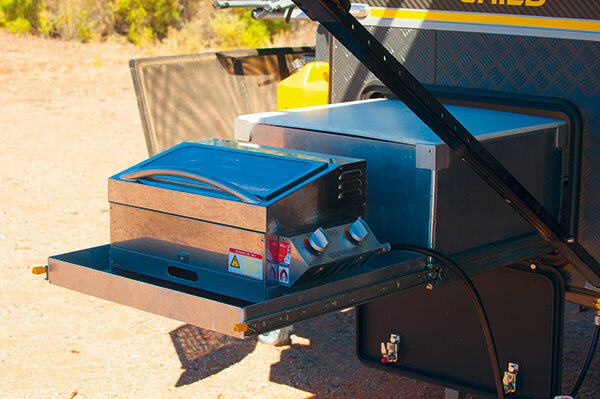 And it has the capacity to go off-grid for extended periods courtesy of its fail-proof AL-KO running gear—Enduro Outback independent coil spring suspension with twin shocks and ‘Click Lock’ articulated Off-Road Pin Coupling—plus battery (1x120Ah AGM), solar (1x150W) and water (2x95L) arsenal. Oh, and it also boasts a gargantuan 1100kg payload! The van itself made child’s play of the trying topography, but there were a couple of hiccups when Sunseeker head honcho Chris Michel’s Mazda BT-50 ‘carked it’ on a steep incline while climbing a challenging section of the Barrier Ranges, resulting in the Hema Map LandCruiser support vehicle taking over as its tow tug for the remainder of TTT. And poor old Chris couldn’t take a trick when the LandCruiser became bogged while the TTT crew was tackling the shifting sand of the Mundi Mundi Plains' river beds, which resulted in a hastily arranged sand retrieval. 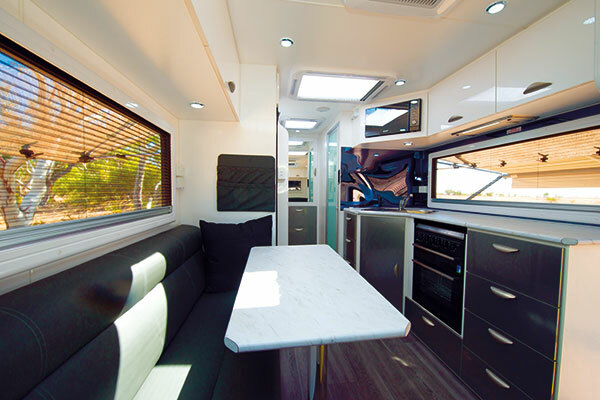 Regardless, the Wild Child combines creature comforts with a very tough and lightweight aluminium frame (stronger, lighter and won’t rot out), high checkerplate, full composite exterior walls and one-piece fibreglass roof. 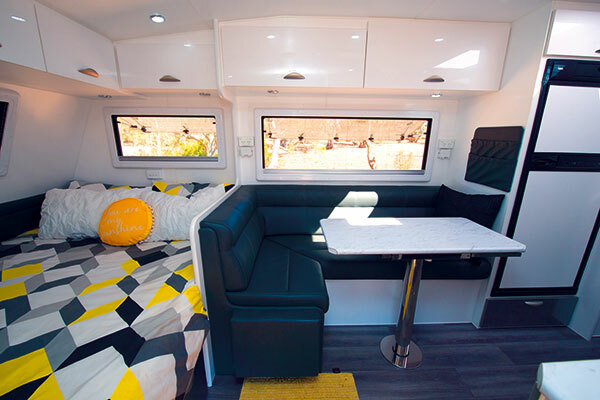 Externally, the van is laden with features highlighted by a slide-out barbecue (an al fresco camping chef’s delight), massive toolbox with generator slide, exterior shower, a bike rack quartet (a clear winner with the kids), stone deflector with mudflaps, twin tunnel boots, external TV point, external speakers, drop-down picnic table, and an easily accessible spare wheel mounted on a four-arm bumper bar. 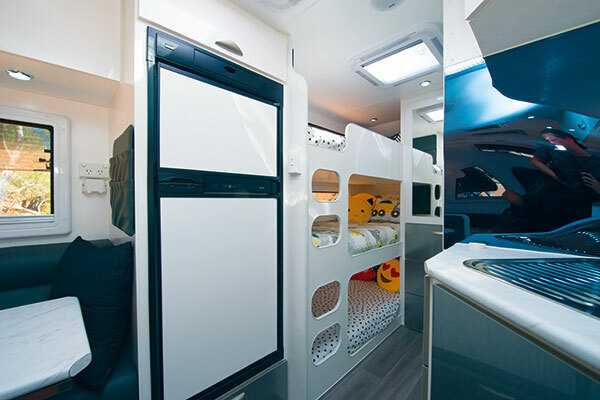 Obviously a major point of internal difference with the Wild Child is an east-west caravan-queen-size bed with a robe and wraparound overhead cupboards, large 6ft bunks, and separate shower/toilet—all in a 19ft 6in van! It definitely is an intelligent interior layout with all the necessary mod cons in the living and kitchen zones, and also the rear ensuite. I also appreciated the level of LED lighting, along with the natural light and ventilation provided by panoramic double-glazed Euro-style windows and a couple of large skylights. 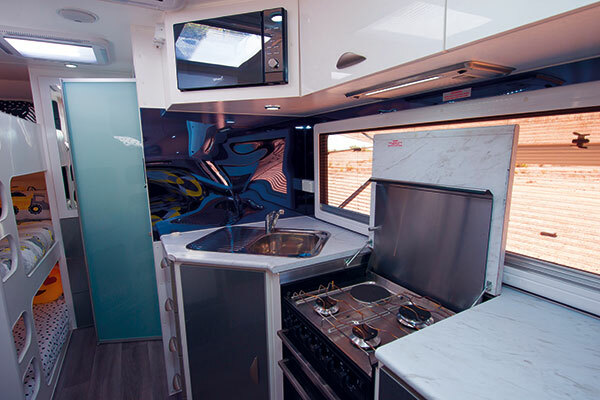 The palatial L-shaped lounge and well-equipped angled kitchen (with Swift four-burner cooktop, grill and oven) are space saving, and both have abundant storage space. It all adds up to an ultra-modern interior complete with a premium acrylic finish to all of the piano-hinged cabinetry. But what really caught my eye, across from the galley and adjacent to the lounge, is a 183L Thetford two-door tropical climate class three-way evaporative fridge/freezer with fridge fan that won’t let you down in the clammy, humid conditions that can seasonally prevail in the land of Oz. And the Wild Child unequivocally reveals it’s a case of ‘family first’ in the kids’ cave and the bathroom. 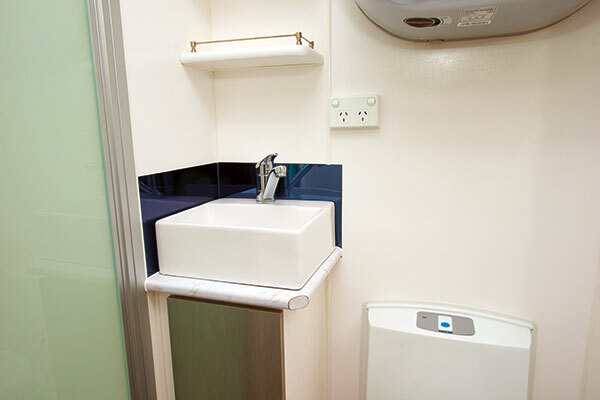 The bunks, with an adjoining sizeable robe, invite relaxation at any time of the day, and I simply had to marvel at the sheer convenience of the bathroom comprising a separate shower and toilet (mini ensuite), and a wall-mounted front-loading washing machine. In-house entertainment is provided by a Fusion sound system (Bluetooth/CD/MP3) and 24in HD LED TV with built-in DVD. And climatic comfort is assured by a Houghton Belair reverse-cycle, remote-controlled air-conditioner. The Wild Child has gone a long way to changing the family van ‘landscape’, so to speak. 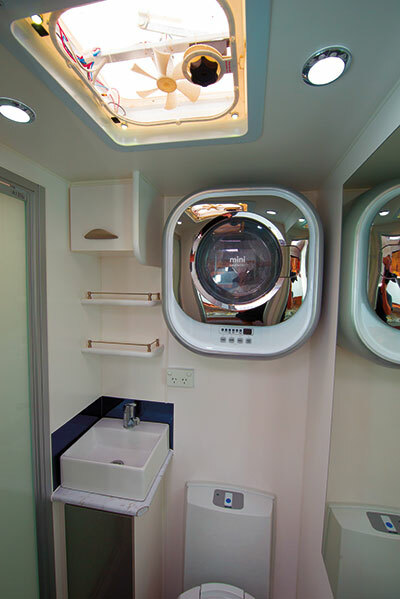 It has the ability to take a family to faraway places in absolute comfort and a total sense of security. With the fiscal ability to fork out just under $80K, you could be calling this Sunseeker your “sweet child of mine”.